A July 1900 letter to Rev. MacKay from Thomas Humphries, indicated that there was 95 Chinese owned establishments in Toronto. In this letter, Hong Lee was listed as the resident at 215 ½ Queen St. East. The assessment rolls list confirm that Lee lived at this address from 1898-1902. Lee first moved into 215 ½ Queen St. East when he was 34-years old before moving sometime in 1902, as he is no longer listed in the assessments from the year 1903 on wards. 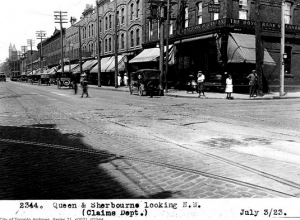 An image of 1923 Queen Street East at Sherbourne St. It is difficult to imagine that the now vacant store below was once Hong Lee’s Laundromat. In fact, there is no longer a 215 ½ Queen St. East. Instead it is just 215 Queen St. East. 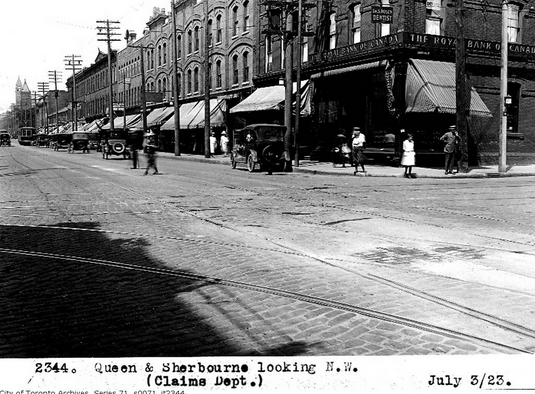 During Lee’s time at the address the main intersection was Queen St. East and Sherbourne St. This has not changed, with the exception of the next street west being Jarvis St. instead of Fredrick St.
215 Queen Street East is now a vacant piece of land and is one unit. The Goads Fire Insurance Plans from 1899 does not list the house number 215 ½ on Queen St. East. However, it is listed later on in the 1924 Goads Fire Insurance Plan. The 1924 map indicates that the building was made out of brick. Furthermore, while the assessment role for year 1900 lists Lee as living alone, in the year 1902 it is noted that he lived there with another resident. Goads Fire Insurance Plan for the year 1899 does not show 215 1/2 Queen Street East. Goads Fire Insurance Plan for the year 1924 shows 215 1/2 Queen Street East. From the assessments it can also be noted that Lee was Christian and that his taxes went towards the Public School system. His landlord was Phillip Jameson and his property was 11 x 120 Square Feet.